DURHAM, N.C. -- USA Baseball and the Chinese Taipei Baseball Association announced today that their Collegiate National Team programs will compete in an international friendship series in the U.S. for the first time since 2008. In 2010, the two countries resumed friendship series play at the collegiate level with Team USA traveling to Taipei, Taiwan for a four-game series -- the two nations split the set, 2-2. 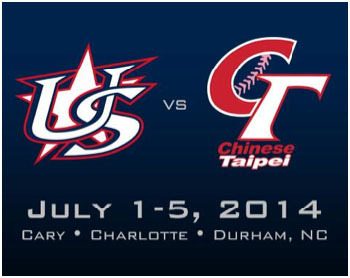 The 2014 edition will see the Chinese Taipei Collegiate National Team travel to the United States, and feature games across at least three locations in North Carolina from July 1-5. USA Baseball records show the two teams have met 102 times at the collegiate level since the U.S. defeated Chinese Taipei, 2-1, at Dodger Stadium on July 31, 1984 as part of the Los Angeles 1984 Olympic Games. The U.S. holds an 84-18 record, including a 63-6 record in games played in the United States. The five-game set is part of the Collegiate National Team’s 2014 summer tour, and will serve as preparation for international competition throughout July. The 2014 USA Baseball Collegiate National Team will be led by Arkansas skipper Dave Van Horn. Van Horn previously served as an assistant coach on the 2011 Collegiate National Team. Players will be invited over the course of the college baseball season, and the final 24-man roster will be announced at the end of June. The 2013 Collegiate National Team played international friendship series against Japan and Cuba, sweeping the latter in a five-game set held in the U.S.